The Conservation Trust for Florida announced the protection of 2,198 acres of important habitat and working ranchland in the Everglades Headwaters National Wildlife Refuge and Conservation Area by the U.S. Fish and Wildlife Service and the Florida Forest Service, a division of the Florida Department of Agriculture and Consumer Services. The USFWS purchased a 662-acre conservation easement from Adams Ranch, Inc., in a transaction facilitated by the Conservation Trust for Florida. The purchase protects one of the last remaining grassland and longleaf pine savanna landscapes in eastern North America. It was funded by the Land and Water Conservation Fund, which was recently reauthorized by Congress. Additionally, the Florida Forest Service purchased a 1,536-acre conservation easement from the ranch, which builds upon previous protection efforts funded by the Rural and Family Lands Program. The 24,000-acre Adams Ranch is located between the Three Lakes Wildlife Management Area, Avon Park Air Force Range, Kissimmee Prairie State Preserve and the St. Johns River. The property is situated within the heart of the national wildlife refuge and the Kissimmee River Basin, where significant hydrologic restoration is ongoing to improve water resources critical for Everglades ecological functioning and safe drinking water for South Floridians. Protected habitat on the ranch includes pine flatwoods, dry prairie and a large forested hammock known as Barber Hammock. Dry prairie is a globally-imperiled habitat found only in subtropical Florida and is characterized by nearly treeless plains rich in grassy vegetation. Home to the endangered Florida grasshopper sparrow and other species of special concern, the quality and extent of remaining dry prairie habitat continues to decline as a result of conversion to other land uses. In addition to being part of a growing network of protected lands forming a large wildlife corridor, these recent purchases could help with recovery of the Florida panther. The ranch also has resources related to historical events dating back to the Civil War. 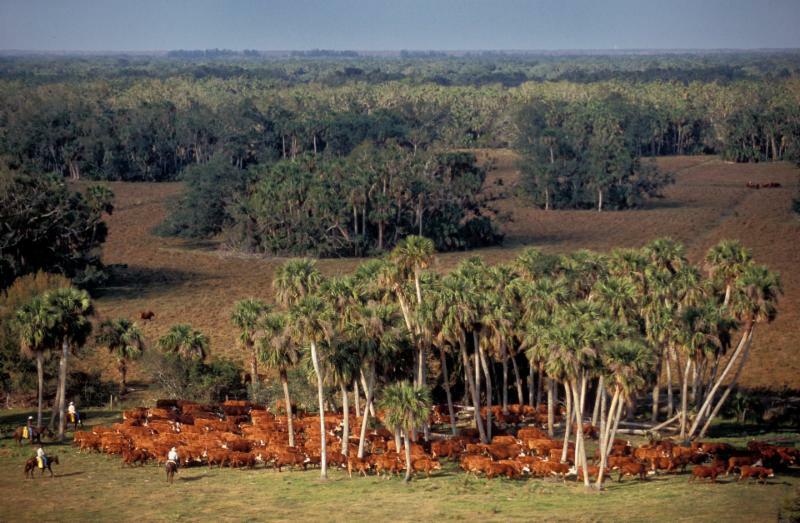 Privately owned ranches in Florida, such as the Adams Ranch, are becoming increasingly more valuable for conservation as the state's population continues to climb. Many ranchers have preserved the natural resources and ecological sustainability of their land for generations. The Conservation Trust for Florida works with landowners whose properties are located within a network of conservation priority areas to implement projects that protect agricultural, wildlife and water resources. "Florida's ranch families are leading the way in terms of how Florida's natural resources are being protected for future generations." The Conservation Trust for Florida was joined in its work with the Adams Ranch and the USFWS by the National Wildlife Refuge Association, which supports the Everglades Headwaters National Wildlife Refuge and Conservation Area in Florida and other wildlife refuges nationwide by working in Washington D.C. to secure funding and support for the USFWS. "This is land and water conservation at its best," said David Houghton, president of the National Wildlife Refuge Association. "Florida's ranch families are leading the way in terms of how Florida's natural resources are being protected for future generations." "It's an honor for Adams Ranch to protect land as part of the Everglades Headwaters National Wildlife Refuge" said Mike Adams, president of Adams Ranch, Inc. "We take pride in our management of Florida's natural resources, as well as our cattle, and conservation easements will allow our succeeding generations to enjoy this heritage as well." "The Conservation Trust for Florida congratulates the U.S. Fish and Wildlife Service in its efforts to build a network of conservation lands in the Kissimmee River basin that will protect scenic landscapes, water resources and the ranching heritage for future generations" said Susan Carr, executive director of the Conservation Trust for Florida. "Families like the Adams are leaders in the ranching industry, which is important to our economy. Their dedication to keeping these large ranches intact will preserve Florida's unique ranching lifestyle and provide essential habitat for wildlife." "Our agency is proud to have worked with the Adams and three other ranches in this Everglades Headwaters region to protect historic, environmentally significant ranchlands in the path of development so that Florida may enjoy its agricultural successes and secure its landscapes and open space,"
"These conservation easement partnerships leverage resources and enhance efforts to protect Florida's natural habitat while helping farmers and ranchers keep their land in agriculture," noted Roney Gutierrez, assistant state conservationist for the Natural Resource Conservation Service's Florida Easements Program. The Conservation Trust for Florida collaborated with the Florida Forest Service on its Adams Ranch conservation easement purchase using Florida's highly successful Rural and Family Lands Protection Program. Additional funding for this transaction was provided by the U.S. Department of Agriculture, Natural Resources Conservation Service's Agricultural Conservation Easement Program. Created in 2001, the Rural and Family Lands Protection Program protects Florida's valuable agricultural lands through conservation easements that ensure sustainable agricultural practices and reasonable protection of the environment without interfering with the continued economic viability of agricultural operations. Created in 2014, the Agricultural Conservation Easement Program provides nationwide financial assistance to partners for purchasing conservation easements that protect the agricultural use and conservation values of eligible land, helping farmers and ranchers keep their land in agriculture.